"Return on Courage" Comes Out Today! Here's Why You Shouldn't Read It. Most likely it isn’t for you. 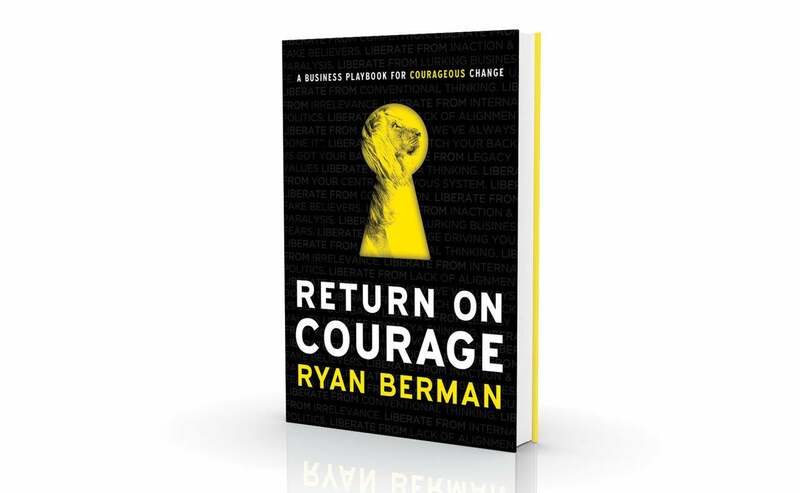 My book Return On Courage, a playbook for courageous change, comes out today. Just what the business world needs, right? Another book addressing the need for transformation — especially because we already know that 70% of new corporate initiatives fail. That 95% of all new companies don’t survive their first five years, and 80% of start-ups won’t make it 18 months. REASON #2: Too much hierarchy. The egos and silos that exist throughout your company are very real. Navigating the politics and the org chart speed bumps isn’t for the faint of heart. REASON #3: Too hard. Simply stated, change is hard. Change = internal pain. Full stop. REASON #4: Too risky. You have your very elaborate, very steady and very smart annual plan. In fact, your leadership team signed off on this plan back on a Friday sometime during 3rd Quarter of 2018. It might have been early 4th Quarter…. who can remember. Deviating from this plan — or even considering bringing up the idea of deviation — is far too risky for your business (and your personal reputational currency). REASON #5: Too expensive. Change is expensive! Quite often it’s an unexpected, additional cost never accounted for as a line item. And who wants to be responsible for creating a noticeable vein the size of the mighty Mississippi running down the side of your CFO’s face and neck? Please step forward? Most are taking a step back. REASON #6: No Guarantee. On top of all this, just because you commit to change, there’s absolutely no guarantee that making change will work for you. That unknown result might be the scariest of them all. Did I happen to mention that 52% of the Fortune 500 since 2000 are now extinct? That John Chambers, outgoing CEO of Cisco, predicted that 40% of all companies will be dead in 7 years? That 9000 different brands will cycle on and off the Fortune 500 over the next 6 decades? Of course, this doesn’t mean we’re talking about your business. Statistics have always been about describing other companies, right? For those who opted out before we even started …can you blame them? For those of you who are still here — who have shown your tenacity to get to the “why we must unlock courage now” — perhaps this book is for you. “Return On Courage” is for any willing being who wants more out of their career or their company. In these courage deficient times, we need courageous now leadership more than ever. There are a lot of people who want to be courageous. We just don’t know how to take that level of action in courageous fashion. For all the reasons people allow the status quo to remain unchanged in their company, there are four unshakable truths of the current Business Apocalypse. If just one of these were true, it would be brutal enough. The fact that all four are is the reason companies need to embrace corporate courage now and immediately begin addressing change. 1. Companies Are Perishing At An Alarming Rate. 2. What Got You Here, Won’t Keep You Here. 3. You Need Time, But Don’t Have Time. 4. You Are Evolutionarily Wired to Fear Change. These four truths get covered deeply in the first half of Return On Courage. They were brought to life thanks to interviews with corporate leaders at Amazon, Apple, Domino’s, Google, Method, Tuft & Needle, Royal Caribbean and Zappos. From interviewing Cambridge PhD and fear expert Nicholas Alp, to founding Virgin Galactic Astronaut Loretta Hidalgo (and everyone in between), we unpack these four realities in detail in ROC. What can we take away from these amazingly talented people? But the hardships that come from not changing are even harder. What I’ve learned over the last 1000 days talking to some of the most courageous people on the planet — and what I’ve seen over the last half decade — is that the companies that win are courageous in pursuing change, and the companies that aren’t — the ones stuck in preservation mode — are getting passed by. Or worse - dying off. Where lots of business books before mine have done a wonderful job in helping you nail your why, Return On Courage serves up “the how”. The break-glass-before-emergency process unveiled in the book teaches any willing business, being or brand how to become what I call a Courage Brand®. In essence, this book is the beginning of a hard conversation about the realities of change.I believe it can be grueling to ask for a closed-door-conversation with a superior at work, but remarkably easy to gift a book which serves as WD-40 to a difficult chat. Return On Courage can be your glass-break, which is far better than doing nothing and having your business fade to black. Here’s to you for making it this far. It shows that perhaps ROC can be your go-to courage instructional manual that helps you identify, attack, and shrink business fears head-on. That you relentlessly aspire to play offense, drive change, and innovate forward. That you’re willing to discover how ROC can maximize your ROI. Ryan Berman is the founder of Courageous and the founder of his own Courage Brand called Sock Problems: an altruistic sock company that “socks” problems in the world. He is the author of Return on Courage.